How can you gauge how innovate a company truly is? Is there a metric that comprehensively measures the innovative capacity of a company? It’s a loaded question, I know. There are many ways analysts look at the innovation that comes from within a company using their spreadsheets as lorgnettes, but none of the metrics alone answer the question. You can look at cash flows from investing activities to see what assets a company is purchasing to develop future products. You can look at revenue and income growth, which encompass the affects of innovative products and services. Or you can take the holistic view and see how the actual products and services compare to those of competitors (is the Apple Watch innovative compared to the Pebble, Galaxy Gear?). There are probably hundreds of other metrics you can look at, but watch out, don’t get bit by analysis paralysis. I decided to take a different approach to gauge the innovation index of a company - one you will not find in textbooks. My approach is simple (Excel bravura seems to be a major trend among analysts. I’m a strong believer the less complexity your financial models contain, the more accurate they are). I’m looking at goodwill on the companies balance sheets and the age of the company. 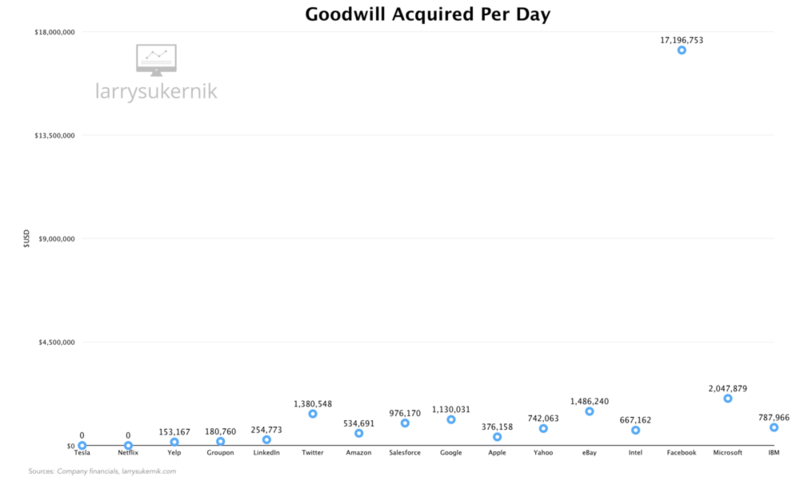 Divide goodwill by age (in days), and you get goodwill acquired per day. The higher the goodwill per day, the more acquisitions a company engaged in over the years. Usually, acquisitions mean external innovation rather than internal innovation, since by definition you are hiring people from outside your company. If you’re not aware of what goodwill is, don’t worry, we will cover that now. When a company buys another company, they will often pay a premium for the other company. In short, that premium is goodwill. The accounting behind goodwill is rather complex, but I think an example will greatly simplify the idea for you. When Apple acquired Beats, they paid $2.6B for the company. Of this, $2.2B was goodwill. Try to imagine the assets of Beats. They might of had some cash on hand, maybe some accounts receivable, some office space, a few company cars, and a bunch of headphone inventory. They probably also had a good amount of debts in the form of accounts and notes payable. If you add all of the assets, and subtract the liabilities, do you think Beats would be worth $2.6B? Of course not! In other words, Apple paid $2.6B for something that is worth around $400M (net of liabilities). In accounting, everything has to balance. The difference between the price you paid ($2.6B) and the net price Beats is worth ($400M) is goodwill. In this case, Apple added $2.2B ($2.6B - $400M) of goodwill to its books. For the accountants reading, I know this is a gross simplification of goodwill calculations, but work with me here! So why does goodwill matter? Well, because it’s essentially external innovation. You purchase innovative, external companies to generate income for you in the future instead of generating it internally with your own employees. There’s nothing wrong with that. In fact, acquisitions are a way of life in some industries. But it’s always better to innovate from within when you can. Normally, older companies tend to start amassing goodwill as they become more bureaucratic, larger, and as a result much slower to innovate. In contrast, younger companies are less bureaucratic, much smaller, and can move fast and break things more easily. They also tend to have much less cash on hand to make the acquisitions in the first place. With all that out of the way, let’s take a look at a few goodwill charts using my simple method. For the chart above, I picked a few well-known companies to see how much goodwill they carry on their books. As you can see, IBM and Microsoft lead the way. IBM has been around in some way or another for over a hundred years, so it’s no wonder their goodwill is almost $30B (goodwill can be “impaired” and written off the books, so this $30B is everything that wasn’t written off over the years). Similarly, Microsoft and Intel also accumulated high amounts of goodwill over the years as a result of many acquisitions. Unlike the ancient tech giants, however, Facebook has not been around for decades, and yet it leads the pack in goodwill. This is mostly due to the WhatsApp acquisition, which contained $15.3B of goodwill. It’s also worth pointing out that neither Tesla nor Netflix have any goodwill, which is because they haven’t purchased any companies. In other words, all of their innovation comes from within the company. Finally, look how low the goodwill of Apple is, despite it being older than Microsoft (more on that later). This chart is where the interesting stuff begins to appear. The simple goodwill metric I was talking about it evidenced here. While it’s by no means a perfect metric (all metrics have flaws), it attempts to show how much innovation is developed internally versus externally. 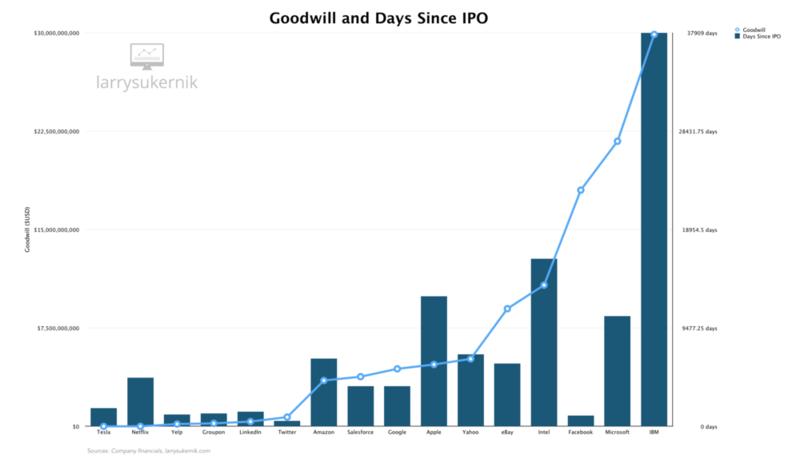 Goodwill is displayed by the light blue line, while Days Since IPO is shown on the navy bar chart. As you can tell, IBM has been around the longest, and also has the highest amount of goodwill. Next on the list is Microsoft, which is relatively old, but has goodwill that is disproportionately higher to its age (look how much higher goodwill is compared to the age of the company). Intel developed most of its technology internally, since the light blue goodwill line is inside the Days Since IPO bar. I won’t detail every company on the chart, but here are some the caught my eye. Amazon develops most of its stuff in-house. Relative to the age of the company, Amazon’s goodwill isn’t too high, which means that Amazon hasn’t made many acquisitions. Google has goodwill that is higher than the age of the company, which tells us a lot innovations made by Google were purchased from external companies. For a large and old company, Apple has a remarkably low amount of goodwill. Crazy low, in fact (it would be even lower before the Beats acquisition, which was one of the largest goodwill acquisitions Apple has ever made). In English, we know this means that almost all of Apple’s products and services are developed internally without the help of external purchases. Since its IPO in 1980, Apple has been able to innovate incredibly well. Facebook, by stark contrast, has a goodwill that is literally off the charts, compared to its age. Of course, this is mostly because of one major purchase (two if you count Instagram). Since Facebook is such a young company, it is too early to tell how innovative it is internally, but the data so far suggests it is not. There isn’t much to say about this chart other than it’s interesting, but not as insightful as the previous two charts. I divided the total goodwill of each company by its age to get Goodwill Acquired Per Day. Again, look how small Apple’s goodwill compares to the other tech giants (IBM, Microsoft, Intel, and Google). Finally, I took the goodwill and divided it by the total assets of each company. While this is a deeply flawed metric, it does attempt to communicate a powerful point: the percentage is how much a company relies on external innovation (see the caveat emptor below for more disclosures before relying too heavily on these metrics). 43% of Facebook’s assets are goodwill - crazy! In contrast, only 2% of Apple’s assets are goodwill. What I like about these goodwill charts is that they confirmed what I always suspected. It’s best to compare the companies as a cohort. IBM is in its own cohort because it’s by far the oldest company. Intel, Microsoft, and Apple are the next oldest cohort. All of the other companies are the third, and youngest cohort. Feel free to make as many cohorts as you like - my only advice is to make a cohort in the first place because it would be foolish to compare IBM to Facebook (IBM has over 100 years on Facebook!). Just to provide an example of how this could be done, let’s take the second cohort of Intel, Microsoft, and Apple. Their goodwill as a percentage of total assets is as follows: Intel 12%, Microsoft 12%, Apple 2%. Judging by the much lower percentage Apple holds, you can draw the conclusion that Apple makes less acquisitions and thus develops more innovations internally. Intel and Microsoft, on the other hand, are just about equal in their reliance on external acquisitions. If you want to beef this metric up, I would even recommend you make a historical comparison of goodwill for these companies just to see how write-downs have impacted goodwill over the years. Before any critics start commenting on this post, allow me to point out the major flaws of this goodwill metric. First, it uses goodwill as of the most recent balance sheet date. This means that if any goodwill was written off in prior periods, the charts above will not factor that in. Next, there is no weighting for the age of the companies. It would be most interesting to compare all of the companies as if they were the same age (Apple at 2 years old, Microsoft at 2 years old, Facebook at 2 years old, etc) so that we see how goodwill compares relative to the age of each company. I wasn’t able to find financial records dating that far back for the older companies, granted I only checked EDGAR archives and could probably find them with more time (perhaps in a future post). More caveats still - goodwill can be the result of overpayment. Finally, it’s a valid argument that goodwill does not imply a company is not able to innovate internally. Perhaps a company with a large amount of goodwill acquired many companies, but nothing innovative came out of them, and instead, the innovation came internally. This is entirely possible, but I cannot measure that in a spreadsheet. 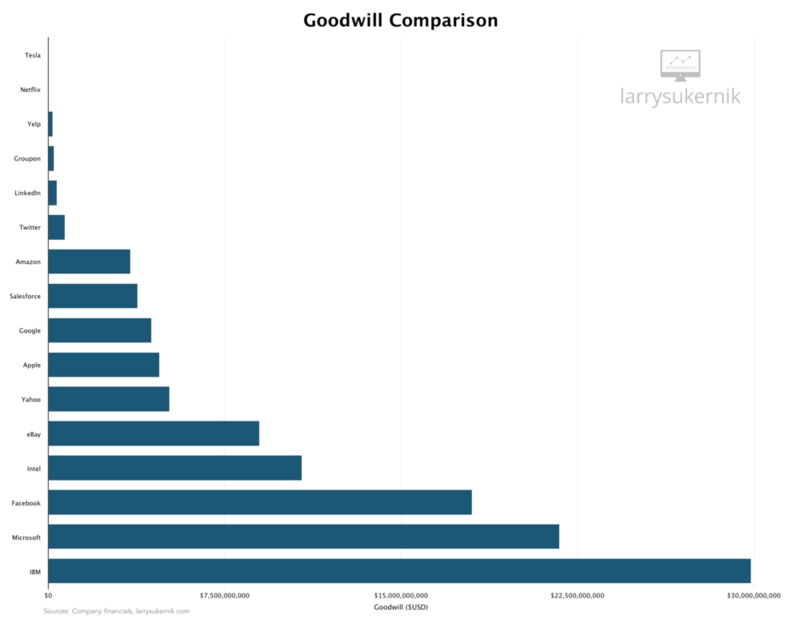 There are many more flaws to this metric, but it still gives us an interesting look into goodwill. I recommend adding it to your arsenal of metrics to gauge a company by. The following is a parable which shows how a company can go from success to failure over the court of its life. It is a simplification of reality. Despite this, this story is still able to teach us a valuable lesson. Revenues are inflows of money. If you sell a bar of soap, you get money. That money is revenue. Expenses are outflows of money. The money it cost you to make that bar of soap is an expense. Why would you ever get into the business of selling soap? Well, you probably thought you could sell the soap for more than it cost you to make it, earning you a profit. Of course, maybe you think your bar of soap will change the world, so you sell it for less than it costs to make. That is, of course, until you run of money. Almost all businesses operate with a profit motive - they're in it to make a buck, not spend it. Assuming you're a rational human being who wants to support yourself and your family, buy nice things, and take beautiful vacations to countries you've only seen on the June page of the calendar, you'll also start a business with a profit motive. So let's continue with our soap business, which hit it big in the last few months. There's been a nasty virus in your town, so everybody started washing their hands dozens of times a day. And luckily for you, they starting buying boxes and boxes of your soap! Revenues on revenues on revenues, you think in delight, as each customer packs a box of soap into the trunk of their car. Since you're selling so many bars of soap now, you were able to negotiate down the price of materials to make the soap, as you are now buying in bulk. Thus, you are making even more profit on every bar of soap you sell! The virus spreads to the neighboring town, and the citizens of this town also start washing their hands dozens of times per day. If somebody loses, somebody also wins. The winner, in this case, is you, since this the citizens of the neighboring town start coming to you for your miraculous bars of soap. This town is so big, however, that you can't make enough bars of soap to meet the demand. So you take your revenues, and you build a soap factory in your backyard. In business terms, you reinvested the revenues you made from selling the bars of soap back into the business in order to build a new soap factory. With this new soap factory, you can make a hundred boxes of soap per day, which is more than enough to meet the demand of both towns. After many years, you're a soap magnate. The virus infected the whole world, and your soap company transformed from a factory in your backyard to a global soap enterprise. In the time since, you've become a public company - you gave shares to your grandma, grandpa, and mom, dad, and your brother, since they loaned you money to build your second and third soap factories. Since everybody in the world is infected, the bars of soap you sell every year is almost the same. At this point, your revenues are constant since you haven't changed the price of soap, and your expenses are slightly decreasing each year, as you become better and better at making soap. And since your revenues are higher than your expenses, your soap company is extremely profitable and earns a net income every year, which you deposit in the fattening bag under the mattress. Personally, you're extremely happy with your soap business. As a kid, you've always wanted to let the whole world enjoy the best soap it can buy, and you've completed your mission. You've also had dreams to travel all over the world, and finally, you have the means to afford it. Now, your soap business shows no signs of slowing down, but it's not growing either. And since you've been profitable for so long, you start giving some of the profits you made to your grandma, and grandpa, mom and dad, and of course, your beloved brother. They believed in you early on, and now you reward them for their patience. This reward, in business-speak, is called dividends. Your grandma and grandpa are very happy with the dividends your pay them every year. They just want a steady flow of cash that they can use every year for their vacation to Florida. And your mom and dad are happy with your dividends too, since they are getting ready to retire and want a cushion of cash to use when they stop working. Your brother though, he isn't happy. Bro thinks that you should make a new line of soap, called shampoo, so that revenues can start growing again. Bro doesn't care that you accomplished your mission of providing the best bars of soap to the world - he wants you to start a new mission of providing the best shampoo to the world. Not because he really cares about the shampoo, but because he wants even higher revenues, and hopefully juicier profits. Now your regret ever giving shares of your company to bro. You are happy with the business the way it is, and you don't want to expand it for the sake of making money. Bro, however, is now a shareholder of your soap company, and he has a say in things. When you gave shares to grandma, grandpa, mom, dad, and bro, you decided to give the most to bro because he was your closest friend and supported you most. You were feeling so generous that you gave bro more than half the shares of the company, and now his vote is majority vote. What he says happens. When he says the company is making shampoo, it makes shampoo. And so, your soap company quickly becomes a shampoo company too, and later a body wash, lotion, creamer, and even lip-balm (bro's wife's sister thought lip-balm was going to be a huge growth market, so bro started making lip-balm too) company. Revenues and profits keep growing, but as the company starts making more and more products, it loses its focus. The quality of the original soap product is no longer the same. The body wash stopped selling as well after a competitor released a new, rock-scented body wash (neutral scents are a huge hit in Washington). The lotion became watered down, ever since bro hired a twelve-sigma-alpha supply chain guru who advised to cut the expenses down. And the lip-balm, which was supposed to be a global phenomenon and sell millions of tubes, actually ended up selling in only one country and was thus a huge flop. Over time, revenues fell, profits turned negative, and the company went bankrupt. You sold your stake in the company long ago, but it still hurts to see the soap company you started go out of existence. You changed the world with the best bars of soap, and now that's all gone. You're not one for regrets, but one always gets to you. Had you held a majority share in your company and not diversified into other products, your bars of soap would still be selling today, and your company would be as successful as ever. But growing revenues and profits got to your brother, and the company grew until it couldn't grow no more, at which time it started aging and losing its focus. Focus, you tell your kids, is what makes a great lasting company. Don't let yourself lose focus, you tell them, as the pits of your eyes start swelling with tears, educed by the fervent regrets of your lost company.